The name “Spokane Opera House” became a thing of the past Tuesday as the downtown building was renamed as part of a 10-year, $1.5 million deal with Inland Northwest Bank. The Opera House, which was built for Expo ‘74, will now be known as the INB Performing Arts Center. Guests soon will see that name on tickets, signs and a new marquee scheduled to be installed this summer. It was the second sponsorship deal announced within the past few months as the Spokane Public Facilities District tries to raise additional money to help pay for maintenance and planned renovations. In March, Group Health announced that it had entered into a multiyear contract to be the name sponsor for new Convention Center exhibit hall, at a cost of $75,000 per year. The PFD continues to pursue naming rights to the Spokane Veterans Memorial Arena and to the Convention Center. Brett Sports initially proposed the corporate naming idea and has a contract to market it. Under the contract, Brett Sports will receive 15 percent of the sponsorship contract for the INB Performing Arts Center. Over the contract’s 10-year life, that will total $225,000. Brett Sports receives 15 percent of any naming rights contract to the Convention Center and a 13.5 percent cut for the Arena. That included the Group Health Exhibit Hall, which earns Brett Sports an $11,250 annual payment. PFD Executive Director Kevin Twohig said the additional money helps provide needed maintenance at the buildings. 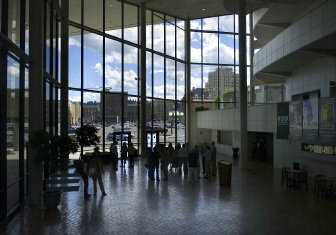 The Performing Arts Center will need at least $8 million worth of work over the next 10 years and the Arena about $12 million over the next 35 years, Twohig has said in the past. About $4 million worth of work is scheduled to take place this summer as the Performing Arts Center is shut down for two months to update restrooms, expand the women’s bathrooms and add family restrooms on each floor. The cooling system for the building also will be replaced, updating it and separating it from the Convention Center’s system. And the front of the building will be relandscaped with benches, drinking fountains, trees, shrubs and grassy space. Additional projects planned for that building in future years include adding two floors of dressing rooms backstage, recarpeting the entire building, upgrading the lobby with a new ceiling and lighting and replacing the glass windows and doors with more energy-efficient models. Renaming the Opera House also will provide exposure for the quickly growing Inland Northwest Bank. Established in 1989, the bank has 11 branches in Spokane, North Idaho and Walla Walla. Total assets have grown from less than $4 million to more than $250 million, according to the bank’s Web site. Bank President and CEO Randall Fewel said the bank is striving to double its assets every five to six years.